Arsenal manager Unai Emery has highlighted that Shkodran Mustafi has not suffered any long-term injury during the recent Premier League clash against Manchester City. 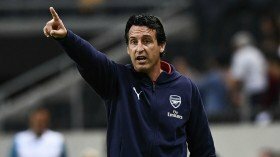 The Germany international was substituted towards the final stages of the game with what appeared like a back problem but Emery remains optimistic that he will return to the mix for the weekend game at Huddersfield. "I think last week he is with some problems also in his head and today, when in the last 20 minutes he was also with some problems. I hope it is not a problem with Mustafi for this week and the next match." he said via The Mirror. In Mustafi's absence, Konstantinos Mavropanos was handed his maiden appearance of the season for the Gunners and the Greek could once more be asked to deputise for the German, should he not recover in time. The north London side are currently short in the central defensive department with both Sokratis Papastathopoulos and Rob Holding on the sidelines but the former is expected to return next month following an ankle injury. Arsenal are currently three points behind Chelsea in the race for the fourth spot but they could close the gap when they face bottom side Huddersfield Town on the road on Saturday.